Soil of India - tradition culture if India gave us many Great Philosophers, saints, Intellectuals, bravery heroes and great scientists. Do we think ever how can they maintain this tradition to produce such heroes? How they bring up them? For making such unbelievable characters like Ram, Krishna, Yagnvalkay, Vishvamitra, Panini, Sushrut, Charak, vagbhatt, Abhimanyu, Vashishtha, Valmiki, Saint Tulsidas, saint Ramdas, Swamy Vivekanand and many more. Ayurveda has given bunch of Medical principles and effective medical treatment systems which are truly effective till now and eternal. In modern science many research works are continuous in work but the result of their conclusions is not permanent. Once they conclude one thing as nectar then after five years they blame that as a poison and make that drugs as banned. Vaccine is invented in near past, but the basic idea of vaccine is described in Indian medical science – Ayurveda but we don’t know about it. Different vaccines for different diseases are our recent vaccine concept. It can prevent only those diseases which it made for. Our body has self resistance power for preventing from various diseases, which is called by immunity. When it is finished then we become ill. Our body can produce immunity itself and vaccine helps to make it faster. Modern Science has prevented several vaccines for several diseases and it is continually moving. The same principles of vaccine (improving immunity) were described in Ayurveda thousand years ago. If our body has sufficient immunity not a single infection or epidemic can affect us. Therefore, Ayurveda gifted us Suvarnaprashan to improve immunity of Child. ‘Suvarna’ means ‘Gold’ and ‘Prashan’ means ‘to lick’. Licking of Gold towards a child from birth to childhood mean up to twelve years called as ‘Suvarnaprashan’. Ayurveda's authorized Book- Kashyap Sanhita indicate to do "Suvarnaprashan" to every new born child.Its ingredient are Vacha, Shankhpushpi, Brahmi, Ashwagandha and Gold bhasma, all r processed in cow ghee and honey. Suvarnaprashan improves Intelligence, Digestive fire, physical power. It gives long, spiritual, holy and saintly life. It gives rejuvenative effects and tone ups the skin. It improves immunity in miracle way so child is prevented by bacterial and viral infections. Regular use of Suvarnaprashan up to one month is results that the child gets best immunity to defeat diseases. six months of regular use of Suvarnaprashan make child very intelligent, and he can remember all heard by him, means it improves memory and intelligence in so much amount. Here at our Clinic we do this Suvarna prashan for d age group of new born to 12 yr baby boys n girls on every Pushya Nakshatra. Can be given everyday for better development off brain to kids. So you can get it from our center or via courier by advance order. you will also appreciates its miracle results after using it. Dosage is varying to the age factor which mentioned by us case to case. Gold is best metal for human body. It is not only effective in children but it is also more effective on all ages’ males and females. Gold is the best medicine to improve immunity power in our body. It is most important and valuable metal by its significant impact on our body and mind. As Indian scriptural it is the best element have to donate to love ones. Gold must have be absorb in our body to make it healthy, the result of this thought Gold Jewels are most famous in Indian culture. If any youngster wear fake jewelry the elders always scolding because of they knows the effect of the Gold. As per this thought our ancient kings and the richest person of the town were always eat in Gold plates. To wear Gold, to eat in Gold plate, to donate Gold, collection of Gold all are the concept to intake Gold to our body. Gold is very valuable metal which used for the body, mind and intelligence protection. Therefore from past to recent time our economy depends on Gold only. It is the Sign of Gold’s effectiveness in our life also. Suvarnaprashan is one of the sixteen ‘Sanskar’ (rituals) which described in Ancient Indian Scriptural. When any child is born in our home; licking him honey by Gold stick and have to write ‘AUM’ is our tradition. The base of this tradition is originally coming from ‘Suvarnaprashan Sanskar’. To lick Gold to the child is originally ‘Suvarnaprashan’. When it is done by everyone, but no one knows that why we do this type of things and what is the effect to the child? Existence of this tradition after thousands of years is shows the constant efforts of our Rushis – our ancient saints. But we never get a single effort to understand this tradition and a miracle vision of our ancients. ‘Suvarnaprashan’ is a mixture of Gold, such nice herbs, cow ghee and honey. As per Indian tradition if we makes in specific time (Pushya Naxatra) it will be more effective. Suvarnaprashan is given to newborn to twelve years aged children. 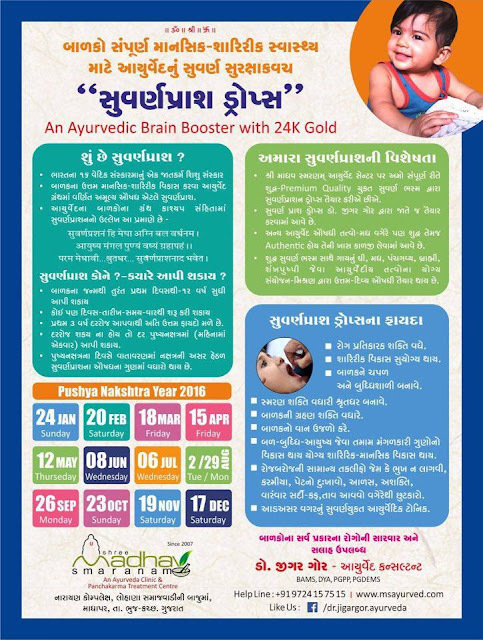 Any one can get benefits of it by starting any time up to twelve years of age.By choosing this kit you will give precious gift to ur new born child.